In an incredible form with his club in recent weeks, the striker of Besiktas still shone with the Cameroon national team. Unique scorer in the friendly match yesterday night against Tunisia, Vincent Aboubakar helped the current African Champions to win in front of the Carthage Eagles (0-1) in their homeland at the Monastir Stadium. 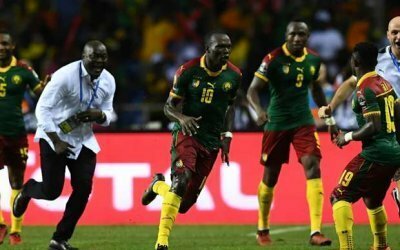 Mr Aboubakar Vincent who own his own gave Cameroon the winning goal of the Afcon Gabon 2017 finals against Egypt still answered present for the defending champions.What a night for him and the nation Cameroon who feels positive about the present Lions squad. Tunisia on its own part who tried to posses the ball and playing low short passes found it very difficult to penetrate the combative defense made up of Teikeu a.k.a Manyang,Ngadeu a.k.a the Berlin wall,Oyongo Bitolo a.k.a the best football dancer and the big boss representing anglophones from Bamenda Fai Collins a.k.a the tallest who all gave the Tunisian attack a 90minutes tough time of play. As we have always said during the Afcon they still made us say Tunisia was put “Dans la Sauce”. What a squad! While hoping for more victories from the Indomitable Lions we hope to seem them beat their next opponents in a friendly encounter in Belgium.